In 2004 the Catholic Bishops of the United States ordered a study be made of the problem of sexual abuse by clergy in America. Since this John Jay College of Criminal Justice study on “The Nature and Scope of Sexual Abuse of Minors by Catholic Priests and Deacons in the United States from 1950-2002,” much has happened to shed light on this problem in the Catholic Church in the United States. Forr one thing, we now know that the study overlooked bishops in the “nature and scope” of the problem. With this new information about bishops, we, in fact, now know both the problem and solution. But, even though the initial report concluded that homosexuality among “priests and deacons” was a significant factor in the problem of clergy sexual abuse, the final report left a different over all impression. By focusing on a technical definition of children which included pre-pubescent children along with post-pubescent young men in their teens, the final report left the over all impression that the more serious problem had to do with clergy sexually abusing pre-pubescent children and not young men. In other words, the final interpretation of the problem appeared as a problem of pedophilia among clergy and not a problem of homosexuality. Since that time, however, new information about bishops sexually abusing young men has come to light. For example, while the Church failed to warn the public about the sexual abuse of seminarians by nine bishops in the United States, it was the “civil justice system” that finally stepped in and exposed them. This revealed that there was not only a serious problem of “homosexual predation on American Catholic youth” by priests and deacons but also, and especially, by bishops. And these nine bishops represent only the bishops with this problem that got caught. 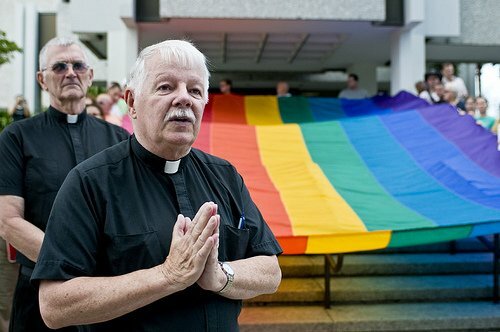 Further evidence of this massive problem of “homosexual predation of American youth” by bishops came from a priest of the Albany diocese, who experienced a network of homosexual seminarians when this priest was a seminarian in the Archdiocese of Newark under the recently debarred Cardinal Theodore McCarrick. And this problem is not confined to the United States. “Nearly 50 seminarians in Honduras have protested against what they say is a widespread and entrenched pattern of homosexual practice in Tegucigalpa’s major seminary.” There is now clear evidence that this “homosexual predation” on young men by bishops, priests, and deacons has become an epidemic throughout the Catholic Church. Today, with this new sad information about the homosexual predation on youth by bishops, it is clear that certain members of the John Jay Study were incorrect when they reinterpreted the final report to say that the problem of homosexuality among the clergy was primarily and fundamentally a problem of pedophiliaamong clergy. This also led to a misdirection of the solution to the problem. Schools and parishes began to advise that children should not be left alone with clergy without some adult chaperone. This focus on protecting pre-pubescent children enabled the problem of homosexuality among bishops to escape the notice of the Catholic Church almost entirely. The presence of homosexual activity among bishops and seminarians was so widespread and connected especially in seminaries, that it impossible to believe that it was not known to many, if not most, of the bishops in the United States —- especially to high ranking prelates who deal with the daily affairs of the Church like problems in seminaries. Consequently, many are saying that the bishops who knew about this “homosexual predation” upon seminarians– and did nothing to stop it– should resign. However, in my opinion, it would be better to come up with concrete solutions to this problem now that we all clearly know about it and have to admit that the problem is truly homosexuality among the clergy including bishops. To this point I would like to offer some concrete recommendations which would bring about a true solution to the problem. First of all, every Catholic must be aware that the media will not help resolve this problem of “homosexual predation of American youth” by bishops if the victims are young men and not children. In fact, bishops who are practicing homosexuals themselves, or others who favor groups like the LGBT, will be protected from transparency by the media, since these bishops are the darlings of the media. The media will be reluctant to report any homosexual relationship of bishops with seminarians or any other young man. Why? Because the media is in favor of freedom for everyone to have homosexual relationships. They think that any Church acceptance of the practice of homosexuality is a step forward in justice and equality.